Whether hiking a challenging multi day peak or just heading out for an easy walk for an afternoon, the GoPro has really opened up the way we document our outdoor experiences. Offering us the option for stellar first person POV action shots, while being durable and compact, there are few cameras out there that can do everything the GoPro does. There are also few cameras that have so many options for accessories and ad-ons. It seems like every camera accessory outfit out there has a dearth of kit for the GoPro, everything from mounts to straps to carrying cases. The selection can be a bit overwhelming when trying to determine what are the most useful accessories to take on a hike and it basically depends on your need. Do you want to be hands free or are you looking for more of an extendable selfie stick set up? What are the benefits to either and what are some of the must have accessories out there for both the serious and the novice hiker? What about buying a kit? There are so many kits out there right now that have a huge amount of accessories in them for a surprisingly low price. But how to separate the wheat from the chaff? 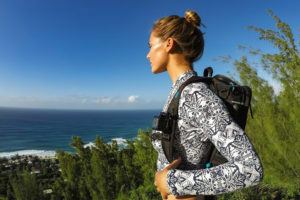 I’m here to bring you my 5 best GoPro accessories for hiking so you can spend less time shopping and more time out there in the great outdoors!